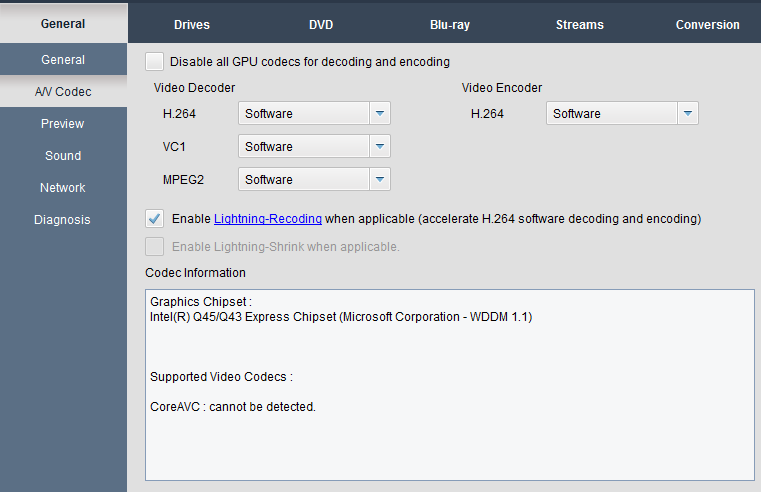 Settings on this page refer to the applied video decoder and encoder per different sources (H.264/VC1/Mpeg2). Currently, only Software and Mac OpenCL are available. A program which uses pre-defined algorithms to encode, or compress audio or video data for storage or transmission use. Currently, Software and Software+ Mac OpenCL are the options. If your computer is powerful enough, you can disable all the GPU codec’s to pursue a most dependable processing. The homebrew technology by DVDFab applied in Blu-ray Copy Full Disc and Main Movie modes to considerably enhance the converting speed when it comes to compress H264 video. Sidenote: GPU acceleration and Lightning Recoding are not expected to be applied simultaneously. This information shows the capability of your Graphic Chipset and supported video codec’s of your system.